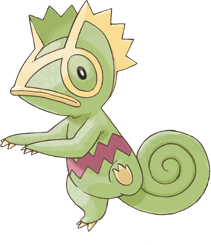 Kecleon does not evolve/is not evolved into. X It can freely change its body’s color. The zigzag pattern on its belly doesn’t change, however. X Il change de couleur à volonté, mais le motif en zigzag qui orne son ventre reste le même. X Puede mudar el color de su cuerpo a voluntad, pero el dibujo en zigzag de su panza nunca desaparece. X Può mutare il colore del corpo a piacimento. Tuttavia, il motivo a zigzag sul ventre non cambia. X 몸의 색을 자유롭게 바꾸는 능력을 가지고 있다. 배에 있는 톱니무늬만은 바뀌지 않는다. Y Il se fond dans son environnement en changeant de couleur, mais le motif sur son ventre reste le même. Y Acecha a sus presas adaptando sus colores a los del paisaje, pero los dibujos de su panza nunca cambian. Y Cambia colore per mimetizzarsi e sorprendere la preda. Il disegno sulla pancia rimane sempre visibile. Y 몸의 색을 바꿔 풍경에 녹아들어 먹이에게 다가간다. 배의 모양은 지울 수 없다. Omega Ruby Kecleon alters its body coloration to blend in with its surroundings, allowing it to sneak up on its prey unnoticed. Then it lashes out with its long, stretchy tongue to instantly ensnare the unsuspecting target. Omega Ruby Kecleon verändert seine Körperfärbung, um sich seiner Umgebung anzupassen. Dadurch kann es sich prima an seine ahnungslose Beute anschleichen. Es schlägt mit seiner dehnbaren, langen Zunge aus und fängt sie. Omega Ruby Kecleon change la couleur de son corps pour se fondre dans son environnement, ce qui lui permet de s’approcher de sa proie sans être repéré. Il envoie ensuite sa grande langue élastique pour piéger sa proie qui ne se doute de rien. Omega Ruby Kecleon modifica la coloración de la piel para camuflarse en el medio en el que esté. Así, puede acercarse a hurtadillas a su enemigo sin que se dé cuenta y lanzarle la larga y elástica lengua que tiene para atraparlo por sorpresa. Omega Ruby Kecleon varia la colorazione del proprio corpo per mimetizzarsi con l’ambiente circostante, consentendogli di tendere un agguato alla preda senza farsi notare. Poi l’attacca con la sua lingua elastica sopraffacendola. Omega Ruby 몸을 경치와 같은 색으로 바꿔 먹이에게 들키지 않고 살며시 다가간다. 길게 늘어나는 혓바닥으로 빠르게 잡는다. Alpha Sapphire Kecleon is capable of changing its body colors at will to blend in with its surroundings. There is one exception—this Pokémon can’t change the zigzag pattern on its belly. Alpha Sapphire Kecleon kann die Farbe seines Körpers bei Bedarf verändern, um sich seiner Umgebung anzupassen. Es gibt allerdings eine Ausnahme: Das Zickzackmuster auf seinem Bauch kann es nicht verändern. Alpha Sapphire Kecleon est capable de modifier les couleurs de son corps pour se fondre dans son environnement. Il y a cependant une exception : ce Pokémon ne peut pas modifier la figure géométrique en zigzag sur son ventre. Alpha Sapphire Kecleon puede alterar la pigmentación de la piel para mezclarse con su entorno. Lo único que no es capaz de cambiar es el trazado en zigzag que tiene en la panza. Alpha Sapphire Kecleon è in grado di mutare il colore del proprio corpo per mimetizzarsi con l’ambiente circostante. Tuttavia, fa eccezione il motivo zigzagato sulla pancia, che rimane sempre visibile. Alpha Sapphire 몸의 색을 자유로이 바꿔서 주변의 경치에 녹아들 수 있다. 배의 삐쭉삐쭉한 무늬만은 바꿀 수 없다. Ruby Kecleon is capable of changing its body colors at will to blend in with its surroundings. There is an exception - this Pokemon cannot change the zigzag patterns on its belly. Sapphire KECLEON alters its body coloration to blend in with its surroundings, allowing it to sneak up on its prey unnoticed. Then it lashes out with its long, stretchy tongue to instantly ensnare the unsuspecting target. FireRed It changes body color to blend in with its surroundings. It also changes color if it is happy or sad. LeafGreen It changes body color to blend in with its surroundings. It also changes color if it is happy or sad. Emerald A POKeMON that has the ability to alter its body colors to match its surroundings. 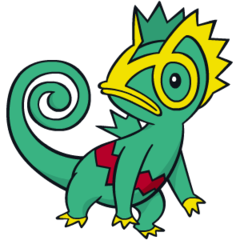 A KECLEON reverts to its original colors if it is startled. Diamond It can freely change its body's color. The zigzag pattern on its belly doesn't change, however. Pearl It can freely change its body's color. The zigzag pattern on its belly doesn't change, however. HeartGold It changes its shading to match its surroundings so it can sneak up on prey. Only its belly patterns stay fixed. SoulSilver It changes its shading to match its surroundings so it can sneak up on prey. Only its belly patterns stay fixed. Black It can freely change its body's color. The zigzag pattern on its belly doesn't change, however. White It can freely change its body's color. The zigzag pattern on its belly doesn't change, however. Black 2 It can freely change its body’s color. The zigzag pattern on its belly doesn’t change, however. White 2 It can freely change its body’s color. The zigzag pattern on its belly doesn’t change, however.